There are countless men and women today suffering from the painful effects of growing up without a father in their lives. I understand that pain! But in The Father You’ve Always Wanted, Ed Tandy McGlasson helps readers understand the healing and hope found in God our Heavenly Father. I wish I could pass this book out to every dad I know. Ed McGlasson is passionate about helping men become all they were meant to be. This book is a compelling read with very practical insight. Ed is one of my most favorite authorities on fathering and men issues. Thanks Ed for writing this book. "Performance-based approval" is the story of my life and when you said "Performance-based approval is one of Satan’s greatest weapons." it hit home. Sadly I could look back and see that probably far too often I had unknowingly done the same things to my son as my dad did to me in how I reacted to various situations. The good news is this is a book of hope in that there is a Father that loves us -- unconditionally. And it is never too late. I would encourage anyone who has ever felt they had o "earn" the love of their parents by their performance to read this book! Did you know that there is a castle in Southern California? The Castle, home and headquarters of Teen Challenge of Southern California, a ministry which provides faith-based solutions to teen addictions, isn't like the castles of Europe that you've seen in movies, full of knights and nobles. Instead, this castle is filled with spirutal orphans who have never known the love and blessing of a father. I have enjoyed the privilege of speaking at many idfferent venues there past years, but to tell you the truth, I have never witnessed the kind of hunger I saw that night in the Castle. It was clear form the first worship song that the room was filled with a gratitude that comes to those whose lives have been rescued from the gutter. Tears were glowing soon after I began speaking that night. At the end of the message, I asked the crowed, "How many of you did not have a father who knew how to love and bless you?" There was a sea of hands all over the room, and before I finished the inviation to come foward, they rused the stage. How many of these young lives had been set adrift because of not having a long father? What they needed was a new Father, and Jesus came to give them that relationship. Like many dads, my own early attempts at being a father failed miserably. I was raising PKs - pastor's kids - who were resenting the life and the ministry that I was living. Our family was broken because there was not a loving father present: me! What I needed was not another attempt at becoming a better dad. I needed a miracle in my heart. Without a blessing from my own father, I had litle to give my kids. I needed an encounter with God the Father so that my heart could turn away from myself and toward my kids. I have never met a dad or mom who didn't want their kids to have a better life. Yet they struggle to give the love and blessing they themselves are still waiting for from their own fathers. I spent many years trying to prove myself to replace the blessing that I never received from my father. I met an eighty-three-year-old Jewish man who told me, "I was never blessed by my father as a young boy. All I ever wanted from my dad was for him to tell me one time that he loved me and that he was proud of me." This man went on to tell me that he had lived his entire life trying to prove himself worthy of his father's love and never received it. When fathers ache from the loss of their own father's love, it can set them on a path of doing the same things to the chidlren they love. So how does God hea the wounds from your father? Effort alone didn't work for me. My good intentions were short lived. What I needed was an encounter with the only Father who could turn my wounds into a blessing. It is time to stop beating up fathers and instead give them some tools and answers. It is my hope that this book is both miraculous and practical. It will be miraculous as you encounter the blessing of the Father for your own life - not in my power, or yours, but in God's - and practical in the many ways that you will be able to transfer that blessing to those you love. This book is for both men and women who are still missing the blessing that has eluded them. The Bible says in Malachi that there will be a day when God will "Turn the hearts of fathers back to their chidlren" (Mal. 4:6). I believe that we are in that day right now! Without the healing of men's hearts, we have little hope of turnig the tide that is threatening to drown our families. Jesus made a promise to His disciples before He went to the cross. He said, "I will not leave you as oprhans, but I will come to you" (John 14:18). The word He used for 'orphan' is also translated 'fatherless'. I am sure that many in that crowrd did not understand why Jesus had just called eveyrone in that room "fatherless", especially since most of them lived within their father's community. Jesus was promising His followers the ultimate Father. The Father sent Jesus to unlock the door of our orphanage, and adopt us into His own perfectly loving family. No matter what kind of dad you have—or don't have—you can have the Father you've always wanted. It is a tragic reality that many of us never experience the solid, positive presence of a loving father. But God promised that He would not leave us orphans, that everyone who believes becomes an adopted son or daughter of a loving Father in heaven. With deep conviction and strong encouragement, Ed McGlasson invites you to take heart and have hope in your heavenly Father who loves you, blesses you, and will never leave you. Through this healing message, you will find a new sense of the purpose, identity, and value you have been searching for your whole life. Absolutely life changing! Whether you feel you’ve failed as a father, or you’ve suffered from a harsh father who did not bless you; It’s never too late. In the pages of this book McGlasson maps a path to hope and healing. I pray that this book gets into the hands of every person who has never heard the words “you are my beloved”. WOW! Unbelievably powerful is an understatement in how I would describe this treasure of a read. Within the first few chapters, through my tears, I said to myself...every person on the face of the planet needs to hear this message! 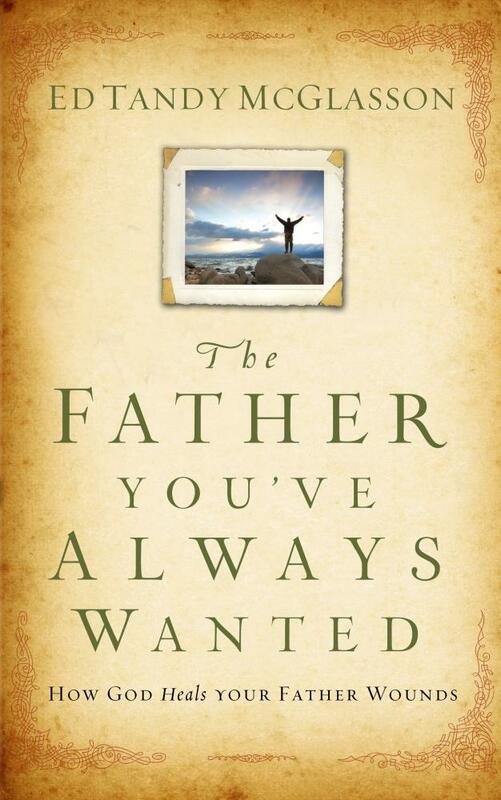 "The Father You've Always Wanted" is a powerhouse and a must read for anyone who has ever had a father or desired a relationship with a father. It's profound truth and penetrating impact has been deeply imbedded into the recesses of my heart, never to be forgotten. Outstanding Ed... simply outstanding! May God continue to shine His face and blessings upon you my friend.